Blackjack card game is highly popular around the world. Players have to be very skilled to learn how to play blackjack, as it is very complicated game. Blackjack odds of winning can be high only if players fully understand the rules of the game and basic blackjack strategy, which means that players should understand the difference between playing soft hand and hard hand. 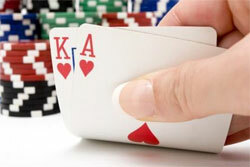 The matter is that most of the beginners play using so called “basic blackjack chart”. In order to play as successfully as possible, the blackjack strategy chart was created to make it easy to make each decision, depending on player's and dealer's cards. The matter is that there is no one common for all game variants and game peculiarities chart – there are several of them even within one and the same game variant. During the game you may have two principal types of hand – hand and soft on, which differ only in count of Ace (or its presence at the hand you have). Hard hand is the one, where Ace is not presented or where the Ace is counted as 1 point (in soft hand it is values in 11 points). Follow the below described recommendations to boost your chances of winning. Having hard 8, a player is not bust anyway. So it is advised to hit. It is advised to double as having small cards, a dealer can easily bust, so it is nice to double the money. A hard 10 means that a player will not bust anyway, as no matter what the third card is, so it is advised to double or to hit. The same as with hard hand 10, a player can easily double as dealer probably goes busted, and this way the winning are doubled. If a player does not want to risk, he/she can simply hit. A player can hit only if a dealer's card is less than 4 or bigger than 6, as the chances of going bust are high. It is advised to stand when having hard 13 -16, as the probability of going bust is really high when taking cards. However, a player may hit when the dealer's card is higher than 6. The risk of busting is the highest when having hard 17 and more. Players are never advised to hit, unless they counting cards. This table could help when making decisions about the nest moves but it definitely does not guarantee the winning. The results depend on the general player's knowledge and skills.